Ashburn (Sandra Bullock) is an extremely good but arrogant and unpopular FBI agent. She plays by the rules, doesn’t swear and gets cases closed. She is sent away to work on a case and comes across Mullins (Melissa McCarthy) a cop who is pretty much the opposite; slobby, foul-mouthed and flouts the rules. Yet, she too gets the job done, and she too is unpopular in her workplace. They start with a hate-hate relationship that quickly turns into a working partnership. It’s ridiculous and stupid, and there is very little base in reality for pretty much anything that happens in the film. But I still loved it. 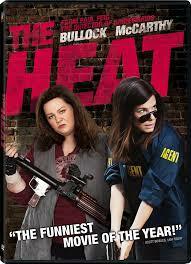 Thank goodness Sandra Bullock still has some comedy to play, because when she stops that, I’ll miss her a lot. (Hopefully she will continue with these roles alongside the Gravity-type serious stuff) Heat 2 is apparently in the making, and I expect I’ll enjoy it, but I really look forward to seeing Melissa McCarthy doing some less over-the-top crazy roles. She’s very good at them, but I’d like to see something different.